For the semiconductor industry contamination is a huge issue. With the arrival of tin and tin/silver solders for lead-free/RoHS compliant electrodeposition, the possibility of trace copper contamination (<20 ppm) due to leaching of copper into the acidic bath solutions need to be monitored in real time to confirm proper deposition. A technician can quickly determine when the plating solution must be replaced by incorporating a real-time copper ion monitor into electrodeposition equipment, before the viable product yields start to drop. Figure 1. Partial Least Squares Regression of Cu (ppm concentration) in an Sn acidic plating solution. A proof of concept study was conducted to generate a plating solution with tin and silver/tin salt solutions dissolved into sulfuric acid. The plating solutions were spiked with serial additions of aqueous copper sulfate and measured using a Guided Wave M508 UV/VIS Spectrometer which was coupled to a 100 mm axial Flowcell. Figure 1 shows that the M508 can establish the difference between 0 and 4 ppm Cu with a linear response up to 70 ppm Cu in Sn. The addition of Ag to the Sn sulfuric acid solution does not affect the optical determination of Cu ion concentration. Three visible wavelengths were chosen for Multiple Linear Regression (MLR) on the spectral data for the 0-20 ppm Cu in Sn samples to check the viability of a photometer, such as the Clearview DB, for the real-time observation of trace Cu contamination of electroplating solutions. A calibration was gathered which estimated that the average error for a photometer would be +/-0.8 ppm over the calibration range, as shown in Figure 2. Figure 2. Multiple Linear Regression of 0-20 ppm Cu contamination of a Sn acidic plating solution. 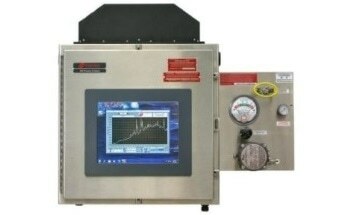 Monitoring for trace (part per million) contamination of electroplating solutions is possible through the utilization of Guided Wave’s M508 full spectrum UV spectrometer. Using a Clearview db Photometer and a 100 mm Teflon™ flowcell, knowledge of when to replace the plating solution due to copper contamination, can be achieved at a reduced cost. To monitor the buildup of copper ions in Sn and Sn/Ag sulfuric acid plating solutions these items can be installed alongside existing plating systems or as OEM by vendors of plating workstations. The proof of concept study discussed in this article suggests that a process analyzer can detect as little as 4 ppm copper in the Sn and Ag plating solution.